We are pleased to announce that we are issuing “Invitation Letters for Study” for 2018-2019 academic year already. The Invitation Letter is the major document to if you are going to study in Ukraine. Invitation Letter looks like as follows. It contains a shining hologram with Ukraine’s National Sign on it, Student’s passport details and the complete name of the University. 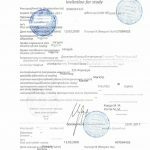 The students who are interested in studying in Ukraine universities in 2018-2019 academic year must send their documents’ scans to us now. We’ll issue and deliver the original of your Invitation letter from your chosen or a recommended university by us within one week using DHL. Steve Consults Incorporated is authorized to enroll students from all over the world and licensed directly from Ministry of Education, Ukraine to deal with all Ukrainian Universities. You can upload your documents through the application process or through our e-mail. You can transfer payment to us by bank transfer, Paypal, Credit Card Securely, Western Union or MoneyGram respectively. After receiving documents and payment.we shall send you the Invitation Letter and visa support letter to your doorstep.